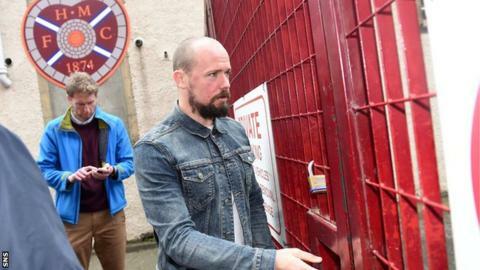 Jamie Hamill has criticised Hearts owner Ann Budge for dispensing with the management team and the club's three most experienced players. Hamill is being released along with Ryan Stevenson and Jamie MacDonald. "I'm bemused by that, especially for Ryan, who has a year left on his contract," said midfielder Hamill. "It's disappointing for the gaffer (Gary Locke), Billy Brown and Alan Combe as well. It's a difficult situation to find themselves in." Former Hearts midfielder Locke had been in charge since February 2013, but he and his management team were unable to steer the side clear of relegation after starting the season with a 15-point penalty and a signing embargo. Budge, who completed her takeover last week as the club edges closer to exiting administration, has appointed former Scotland boss Craig Levein as director of football, with ex-Hearts defender Robbie Neilson as head coach. "The gaffer has been amazing," 27-year-old Hamill said of Locke. "I played with him and worked under him. I think he's handled it brilliantly. "And, along with Billy and Comber, they've kept the place alive when times have been hard. I think it's unfair for the gaffer. "The fans, having spoken to some yesterday, were desperate to see Gary in charge. If you were to ask every player in that meeting this morning, they would love the gaffer to be there next season. "I've no doubt in my mind that the gaffer should be managing a Premiership team and hopefully that will be the case." Goalkeeper MacDonald, 28, has spent his whole career at Tynecastle, midfielder Stevenson, 29, is in his second spell with Hearts, while Hamill has been with the club since leaving Kilmarnock in 2011. Hamill said being released was especially difficult to take considering "some of the players taking wage cuts at the start of the season". "I think it is a bit harsh, but that's the world we live in, it's football," he said. "It's difficult, but hopefully I can move on from here. It's the way football is at the moment - it's cut-throat. "I had a quick 25 seconds with Craig Levein and then that was me back out the door. There were no reasons, but I kind of knew it was coming, so I sort of planned for not being here next season. "Ann Budge has come in and put her money into the club and hopefully they come out of administration as soon as possible and get on the up and back to where they belong." Stevenson had expressed his desire to end his career at Tynecastle. "I'm devastated for him," added Hamill. "He's been brilliant this season and Jamie MacDonald has been our best player for the last two seasons, so it's a poisoned chalice for whoever comes and has to wear the number one jersey. Jamie has been magnificent. "Hopefully, we can all get another club at some point. The way it was done could maybe have been a wee bit better, but it is what it is."